Calling Souls by Retrobytes Productions a 'demake' would be a bit of an understatement. Other than gathering souls and saving your game/restoring your life at campfires, this modern retro title bears little resemblance to its majestic inspiration - the mighty, infamous, devilishly challenging Dark Souls by FROM Software. 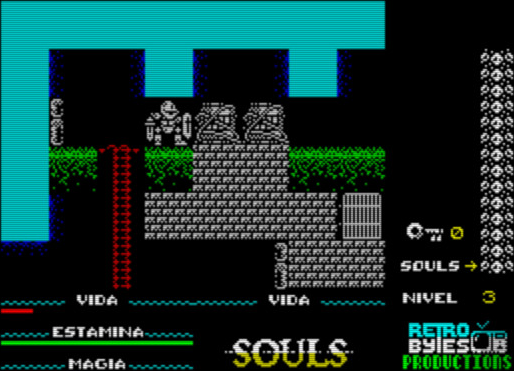 Unfortunately, the limitations of the ZX Spectrum don't translate well to a game attempting to capture this spirit. 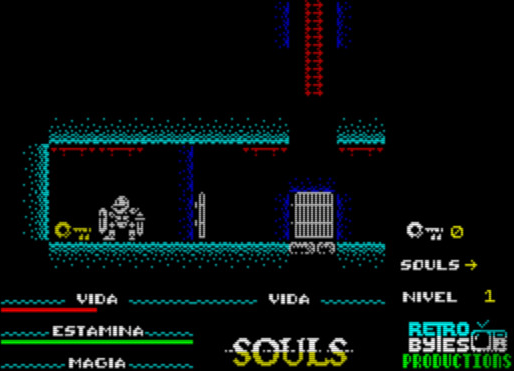 As the protagonist in Souls, a white armor-clad knight giving off a very medieval vibe, the player must explore though a reasonably-sized map of static screens, slaying baddies along the way. 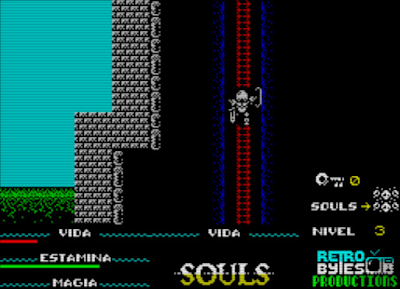 Each demon felled earns the player a stack of skulls representing its very soul, piled up on the right side of the screen; once they reach the top, the player gains a level. Gaining levels grants more life and movement speed. In addition, our knight must also sniff out keys, generally hidden in barrels, in order to access areas blocked by metal gates - as well as magic bottles to refill his magic power, which will come in handy later in the game to take down bigger enemies. 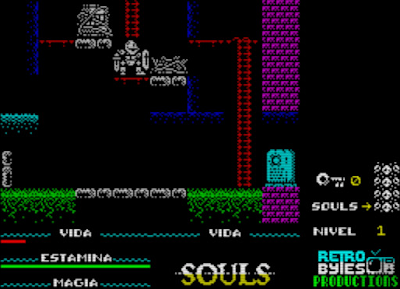 Speaking of taking down enemies, one other way Souls resembles FROM's opus is the combat system - again, I use the word "resembles" loosely here. One cannot simply stab mindlessly in combat with the various creatures, as that behavior is sure to lead to certain death. It's far more beneficial to hold the block key in an attempt to discern your foe's attack pattern and strike strategically. Failure to do this will not only result in the player's imminent demise, but any gathered souls will disappear and our hero will be whisked away to the last campfire visited. It's with this mechanic that I became a bit frustrated with Souls. Combat in Souls is not entertaining. Anticipating your opponent's moves is very difficult, as they seem entirely random and often impossible to block, regardless of skill. An excellent example of this is the giant 'leaf men' or whatever they are - their attacks can be blocked indefinitely, but there is not enough time to fight back without getting damaged yourself. It then becomes a simple matter of whose life bar is longer. Players are forced to then level up their knight in order to take on some of the bigger foes, requiring trips down a ladder, slaying a skeleton, going back up again, sleeping at the campfire, then doing it all over again. Unlike games like Diablo III that make grinding super entertaining by employing a complicated system of various moves and buffs as well as constant (and deliciously addictive) aural and visual feedback, grinding in Souls is just plain boring, if not annoying. I finally gave up when I realized I had to defeat one of the aforementioned leaf men in order to pass to the next area, requiring at least 1 or 2 more levels of painful, mostly silent repetition peppered with bleeps and bloops. I just think that this game could have worked around the limits and been more entertaining by ditching the leveling mechanism and focusing more on varied enemies and environments, making it compelling to see the castle through to the very end. I seriously loved the visual style of this game. Even with its slick presentation, I fear that this title will only resonate with those who have a nostalgic love for the vintage Spectrum plus an appreciation for the challenging art of making modern retro games - players of Dark Souls and similar current-day titles will likely bail out before hitting level two.